Melonport AG was officially founded by Mona El Isa and Reto Trinkler in July of 2016. It is a fully partner-owned, private company domiciled in Zug, Switzerland. In February of 2017, the company issued 599 400 MLN tokens, raising a total of CHF 2.5 million in under 10 minutes. Melonport AG is solely responsible for the development of watermelon, the asset management computer. After delivering v1.0 of the watermelon protocol in February 2019, Melonport AG will wind down and hand over the control over the governance to the watermelon council. 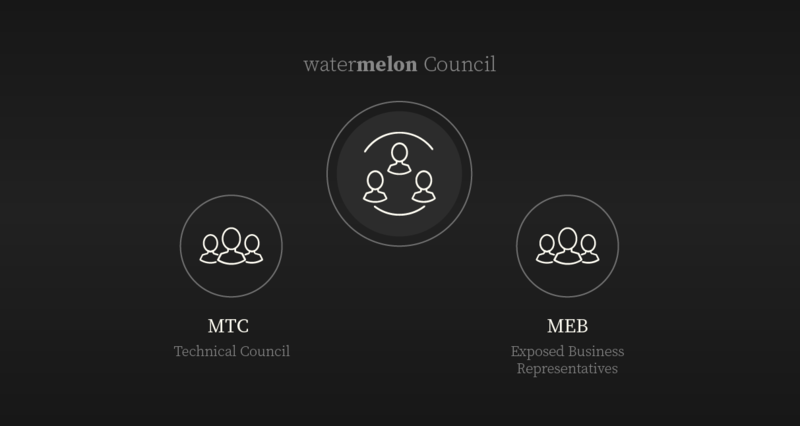 The watermelon council consists of two parts: The MTC (Technical Council) and the MEB (Exposed Business) representatives. Technical Council: A set of technically skilled and conflict-of-interest free individuals, who have a deep expertise of the watermelon ecosystem and a proven track record of high ethical standards and reputation. Exposed Business Representatives: Representatives of the users, whose businesses rely the most on the watermelon protocol. This includes fund managers as well as applications and projects utilising the watermelon protocol. The MEB will work closely with the MTC and serves as a balance to power. The necessity for so many middlemen leads to inefficiency, high running costs, and increased operational risks at every stage. watermelon replaces a large proportion of the middlemen with smart contracts, thus enabling you to perform the same tasks at a fraction of the cost, and with higher transparency, security, and minimised requirement for trust. Disrupting the US$84.9 trillion asset management industry, one block at a time. Our mission is to build watermelon in a way that is inclusive, reliable and transparent. Users do not need to acquire permission to set up funds on watermelon. watermelon is not owned by Melonport AG and Melonport AG does not take any fees; it is intended as a public good, like the internet. As a result, watermelon is open-source, decentralised, free from addictive feedback loops and Melonport AG does not charge any fees for the use of watermelon. Melonport AG was officially founded by Reto Trinkler and Mona El Isa in July 2016. It is a fully partner owned, private company domiciled in Zug, Switzerland. In February 2017, the company created a smart-contract which issued 599 400 MLN tokens and raising a total of CHF 2.5 million in under 10 minutes in exchange for the tokens. First watermelon Manager Competition! This competition aims to enable users to test the watermelon protocol in a safe environment with play money on the Kovan Ethereum testnet. The new watermelon Front-End deployed on IPFS is out: you can check it out NOW (see instructions below).